Cindy Hale and her family went through the whole pre-engineered barn building process and lived to tell about it. It used to be that owners had few choices when constructing a home for their horses. Designs were generally limited to the tried-and-true Plain Jane pole barn: uprights sunk directly into the earth that supported rafters and a roof, with planks of wood slapped onto a wooden frame. These structures were sturdy for a while, but quickly became quaint and rickety. 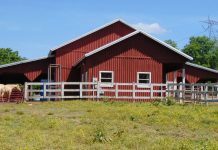 With advances in pre-engineered modular buildings, creativity in design and horse-friendly materials, today’s horse owners can now have the barn of their dreams in just a couple of stress-free days. Barnmaster allows for either scenario. You can contract with a Barnmaster-approved installation crew or put the barn together yourself. Keep in mind that the steel supports of pre-engineered, modular barns are anchored to their cement foundation. With a faulty foundation, the barn can shift, causing stress on its joints and seams. Make note that your particular local codes may dictate specifications for barns. 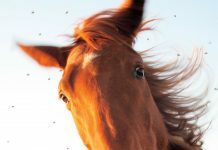 If you’re in the market for a horse home, the first thing to consider is the outlay of your property. Where is the best place for your barn in relation to the rest of your horsekeeping amenities? Simply plopping the barn down in the center of your acreage leaves little planning for current needs such as parking or an arena and disregards any future acquisitions, such as a wash rack, hay barn or turnout paddock. What do you do if your property already has some permanent structures obstructing your ideal barn site? Before you chop down that old oak tree or level your grandparents’ homestead, consult with a representative from your barn manufacturer. No doubt that person can help you come up with a barn configuration that will mesh adequately with your property. The reason? Contemporary pre-engineered barns are modular in form. That means that the framing and stall panels are manufactured in set measurements of 4, 8, 10 or 12 feet (depending on the manufacturer), which allow for some broad creativity in planning a barn’s layout. Inline stalls, for example, are configured just as the name suggests: in a line. That permits a straight row of stalls, a “U,” “H” or “L” shape, or even a back-to-back design where stalls share a common center wall. One of these space-saver barns can fit onto even the most obtusely shaped property. Sometimes paying a little more for some options is worthwhile in the long run. Additional grill work, for example, adds ventilation to your barn and may discourage respiratory ailments in your horses. A final consideration with your new barn’s location is drainage. Though your barn should be installed atop a raised pad, an abundance of rain can still threaten your stalls or at the very least make feeding and mucking a torturous task if you aren’t appreciative of the natural flow of water. If you’re in doubt as to the drainage dilemmas specific to your property, invest in a consultation with a surveyor before marking an “X” for your barn on your hand-drawn map. Remember the tale about the three little pigs? Though you won’t have to worry about a quality pre-engineered barn being huffed and puffed into oblivion, there are differences in the actual materials used to construct them. It’s up to you to objectively look at the data. One relatively easy comparison you can make is to decide if you want a typical steel barn or a wooden one. Though virtually all modular barns are constructed using steel framework, the wall panels can be either a plywood core laminated to steel sheeting or tongue and groove (T & G) wood. But what about fire danger? Suzy points out that the metal roof, combined with treated wood, makes the barn flame retardant. There are, undoubtedly, some drawbacks to even the best wooden modular barns. First, the wood is generally raw. That means that you, the client, must see to it that the lumber is properly sealed and or stained. Next, despite the no-chew promise, a creative horse can still find a way to grate his teeth against the wood, leaving cosmetic blemishes. Finally, wood-loving insects in parts of the country can pose a threat to a wooden barn if the integrity of the wood isn’t maintained. In defense of the steel modular barns, MD Barns’ Terri Bartz says there are options to make them more visually appealing. Beyond choices in exterior and roof colors, there are swank faux applications that lend the look of tongue and groove or even heavy stucco. Also, the non-porous, smooth interior finish of a steel barn makes it easy to wash down and disinfect a stall following a horse’s illness or before foaling out a mare. “That’s why so many veterinary clinics use steel in their modular barns,” Terri says. “Everyone has a dream, but everyone has a certain budget to maintain, too,” Terri acknowledges. When it comes to selecting a pre-engineered barn with a plethora of appealing options, you’ll have to decide between what your heart desires and what you and your horses truly need. Fortunately, there’s help in the decision-making process. Because you’re essentially designing your own barn from a wealth of ready-to-go offerings, it’s easy to get carried away. Fairly soon the dollars add up. Rather than bursting your barn budget bubble and ending up so penny poor that you can barely afford to stock your feed room, think about what you really need. According to Terri, the list of “can’t live without items” can vary from one horse owner to the next. A simple thing such as selecting stall doors suddenly becomes not so simple. Again, sometimes the stylish option—which could add cost to the barn budget—isn’t the best choice anyway. You can keep additional costs low by concentrating on a company’s standard barn styles and comparing those to competitor offerings. Warranties also add to the value of the barn without adding directly to the initial cost. Be sure to inquire about warranties, and make sure that the manufacturer stands behind the product. Many pre-engineered barns offer some sort of kick-through guarantee. 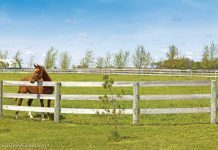 If your horse gets rambunctious and kicks a wall hard enough to break into the wood encased within the steel, that partition or section will need to be replaced. It’s a rare occurrence, but it can happen. A substantial kick-through warranty can potentially save you future repair bills. For horse owners with a penchant for creative design and a love for the look of wood, modular stall companies offer anotherchoice in barn building options. These manufacturers make and sell the components for a dream barn rather than the entire package like mainstream modular manufacturers. “Most of our clients enjoy the benefits of having components that are made to order rather than being prefabricated in set sizes,” explains Woodstar Products marketing and sales director Kelly Bridges. Kelly says that the typical customer already has a pre-existing barn exterior or “shell,” whether it’s made of cement block, fabric, wood or metal. But they would like customized stalls inside. Manufacturers commonly have catalogs of various wooden stall doors, assembled and ready to hang, along with a plethora of metal grill panels that function as inserts for stall partitions. Companies also offer the U-channels that will hold the lumber for wooden stall partitions, any necessary hardware, written instructions and perhaps a video that demonstrates construction of a stall from start to finish. When you have a good idea of your actual budget, you have to determine which style of barn you can afford that also meets your needs. The placement of a barn’s aisle can alter both its look and function. Do you have room to spare on your land? Are you blessed with a liberal barn budget? You might opt for a center aisle design, also commonly referred to as a breezeway barn, which requires additional space and money. In this style of barn the horses look into a covered center aisle. Large doors at either end of the center aisle can be closed during inclement weather. The center aisle provides shelter during farrier or vet visits when Mother Nature isn’t cooperating. During hot spells, the breezeway doors are left open to encourage air circulation, providing you’ve aligned your barn with the usual wind directions. Center aisle designs come with either a raised roof or a gable roof. The raised roof is more expensive because it includes a separate expanse of roof that bridges both rows of stalls. This allows for extra ventilation and is a wise choice for very warm or humid locales. The gable roof is a pitched roof that is continuous from one row of stalls to the other. The degree of pitch and the coziness of the insulation factor make the gable roof appropriate for climates with a lot of winter snowfall. Horse owners in sunny, dry climates often choose a shedrow or inline barn. Though they lack the intimacy of a center aisle or breezeway, the classic row of stalls with the generous overhang still provides shade during hot summer months and an overhead shelter during barn chores. Inline barns are more economical, too, because they make use of shared walls between stalls. Finally, Barnmaster offers a fourth choice: a gambrel barn, which is a variation on the center aisle barn. Despite being a modular barn, Barnmaster’s gambrel barn resembles a contemporary take on vintage barns of the past (think a rounder roof line). With so many styles you can surely come up with a barn that will be a retreat for both you and your horse. I purchased an MD Barn in 2003. I loved this barn, and when my ranch was burned in a massive fire along with 1800 other homes, I chose to reorder the identical barn. MD Barns are not fireproof. I ordered the barn through the Corning office. I paid a deposit on the barn in August of 2016. They advertised that their barns are installed within 8 weeks of ordering. My barn was installed in December. Not 8 weeks. They offered a special at the time of $200 cash rebate per stall, or over $200 in free goods per stall. I was never offered these perks, and it was exactly the time I ordered the barn. MD recommended someone to do my concrete. He was working on my barn without a current contractors license, and he carries ZERO Workmans Compensation. He did an awful job on my concrete, and my concrete is damaged because he did not protect the concrete from a hard frost we had hours after the concrete was poured. I stressed to him that there was going to be a heavy freeze, and he said not to worry about it. I let MD Barns be very aware off this mess with the contractor, and they still use him. He is not the only unlicensed contractor they use/recommend. The concrete contractor also wrote bad checks for the gravel under the concrete on my barn. This is only the beginning of the mess with my barn. The screws in the barn are defective. They are rusting and falling out of the barn, They started doing this within DAYS of installation and MD Barns sent out the contractor who erected the barn. He fixed what he saw, and left. You can literally break off a screw with your fingernail. The barn leaks as well. The contract with MD states the property owner has to supply a forklift to put the barn up, which I did. When the installation contractor arrived to install the barn, he said the traditional forklift (that I rented) would not work, and I needed to immediately get the proper forklift. The truck with the barn on it was waiting in my yard, and they refused to unload the barn until I got another forklift. I had to spend an additional $1800 to get another forklift, in addition to the money I spent for the forklift that was sitting in my yard that I already paid for. I asked MD Barns to reimburse me and again, they refuse to respond. You get the picture of the situation of my barn. I contacted MD Barnmaster in Ontario, CA as well as Corning, CA over 3 weeks ago regarding these issues, that are under warranty. Neither of the above locations has bothered to respond. This is horrible business on their part. This new barn is not nearly the quality of the original barn I had. The steel on this new barn is much lighter and cheaper. My other barn had rain gutters, and with this barn there is just a hole, and the water runs out everywhere into the paddocks. I should have listened to my peers and purchased a FCP barn instead. Obviously the merge between MD and Barnmaster was not a very good thing to do.